Apply a Default Base CPV Bid to new targets you add to your campaign, or adjust your Default Base CPV Bid to bulk update existing targets without custom bids. NOTE: To fully understand Default Base CPV Bids, you should first learn how Conversion Boost℠: Quality Tiers℠ work. What is a Default Base CPV Bid? When you customize your Campaign Settings, you're prompted to enter a Default Base CPV Bid. The amount you pay per impression, by default, from each Conversion Boost: Quality Tier is determined by your Default Base CPV Bid and your Quality Tier slider positions. Default Base CPV Bids are automatically applied to new targets you add to your campaign, as well as any existing targets that do not have custom bids. Your bid for each Conversion Boost: Quality Tier updates relative to your Default Base CPV Bid. Any existing targets in your campaign that do not have custom bids will update to the new Default Base CPV Bid. TIP: This is a quick and easy way to adjust bids in bulk for targets that do not have custom bids. What is the difference between Default Base CPV Bids and custom bids? Your Default Base CPV Bid only applies to targets that do not have custom bids. You can adjust bids for individual targets to optimize ROI. When you adjust a target's bid, the new custom bid acts as the target's own unique Base Bid. That means the amount you pay per impression will be determined by the target's custom bid and your Quality Tier slider positioning. The range shown in the target's eCPV column on your campaign's Targets tab shows how much you'll spend on traffic across all Quality Tiers. Learn more about eCPV. How can I tell which targets have Default Base Bids and which have custom bids? On the Targets tab within a campaign, the CPV column shows each target's bid. In this column, Default Base CPV Bids are gray and custom bids are blue. How can I re-apply my Default Base CPV Bid to a target after I've customized its bid? 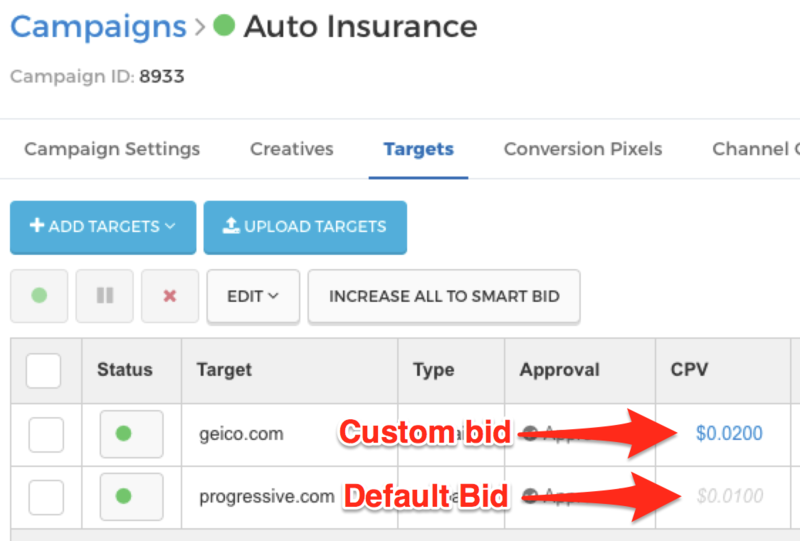 To remove a target's custom bid and re-apply the Default Base CPV Bid, navigate the the Targets tab within your campaign, then click the target's bid amount in the CPV column to open the bid editor. Clear the bid amount by either erasing it or clicking the gray "X" in the bid amount field. When the field is empty, click the blue checkbox to apply the Default Bid. How can I customize my campaign's Default Base CPV Bid? When you create a new campaign, you'll see a Base CPV Bid setting below your Geographic Targets where you can enter your Default Base CPV Bid. You can customize an existing campaign's Default Base CPV Bid anytime in its Campaign Settings. TIP: For optimal volume based on your campaign's settings, apply the Suggested Base Bid shown next to the Base Bid setting.